Supreme Deck, Inc., Brighton Michigan’s premier custom deck builder and contractor, has been providing homeowners with exceptional services and products since 1991. Our experienced crews have pleased countless customers by transforming backyard outdoor living space with our custom wood and composite decks, gazebos and sunrooms. Every home deserves to live up to its potential and we are the deck builder of choice stepping up to meet this challenge. Each project is unique. Together with the homeowner, we will design a deck or outdoor structure that will bring you satisfaction for years to come. 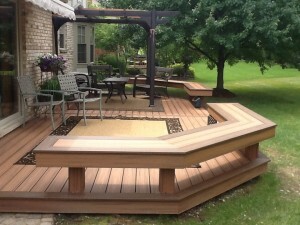 Supreme Deck building contractors in Michigan, offer a wide choice of building materials that we can offer. Our commitment to furnish the highest quality at the most affordable price is still there after all of these years. Home owners are fast picking up on the growing popularity of home improvement. One of these is the installation of custom decks which functions for many different purposes. Decks are ideal home additions since they can be alternative function areas for varied activities, such as social events or family activities. Aside from this, there is the effective elimination of disorganized indoor surroundings since most play and fun activities are implemented outdoors. A TrexPro Platinum builder for Brighton, MI and surrounding areas.